Always wanted to try park but not sure where to start? Or just love park but wish there were more girls about town to ride with? 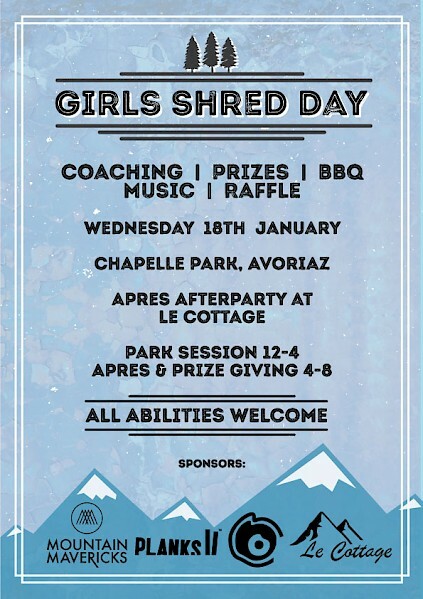 Come down to Chapelle Park, Avoriaz, on 18th January to meet like-minded chicks and for general good vibes! We’ll be having some informal coaching sessions from Laura Berry from Onyx Snowboard School, and a cheeky jam session with loads of spot and overall prizes from our amazing sponsors. So whether you want to try your first box, or get those 5’s finally dialed, come for a shred, get some help and pointers from other girls, and win yourself some stash – no matter what your ability! Skiers and snowboarders both welcome. After the jam we’ll be heading down to Le Cottage for some Apres – think banging BBQ and drinks deals, good tunes and girls ski/snowboard movies! We’ll also be having a bit of a prize giving from our sponsors (to be announced in the coming week!). Oh and it’s FREE Entry! Plus if you sign up on girlsshredday.com then you’ll receive a free demi of Ibex at Le Cottage apres session!